I don't think I ever explained the original tagline of Sorrow at Sills Bend, or that name, or the origin of my nom de plume for that matter. My sense is that the people who read my blog or who I met online simply took these things at face value - just cool-sounding words, no reason to look for a referent. And I enjoyed that idea - while also knowing that in all probability, some readers recognised the references; but also also knowing that those readers who did pick up a reference probably overestimated its importance in what I wanted to say about myself. They were both fairly casual picks: they're both derived from texts that meant something to me at the time I began to create this identity, but the initial found meanings were quickly overtaken by the personal meanings they came to acquire. Some of my friends in the embodied world call me Lucytartan, and I answer when they do. The original Lucy Tartan is a character in the very challenging and extremely excellent novel Herman Melville wrote when he was trying, against his nature, to produce a commercial potboiler romance: Pierre, Or: The Ambiguities. Most people in this book start out as privileged, lucky, golden, and pretty soon (or what passes for soon in Melville time) they become weird. Lucy is the sweet nice pretty girl who is attached like a limpet to Pierre and is going to marry him, and that's all she is. But when he becomes weird, and not just a bit weird, but super super weird, she enters weirdness too, and she becomes real. I loved her. I will never read the book again, though, because it just about killed me. The novel was adapted really excellently by Leos Carax, as POLA X. See it if you can; the film has its own beauty. 'Don't cry little blossom! it's only a story' is a misquoted piece of dialogue from the film of Fahrenheit 451 made by Francois Truffaut in the 1960s. Old-timers may remember I was deeply obsessed with this film, and it was going to figure in the first version of my thesis, which ended up being not about film adaptation in general but about many different kinds of responses to Jane Austen. I did get F451 out of my system, though, in a book chapter that was published in the unblogged years. There is a scene in the movie where the 'fireman' Montag, having recently discovered reading, hurts his wife and her friends by reading them a bit of David Copperfield, where the hero of that novel is sadly anticipating the death of his own annoying wife. I loved the way the movie embedded a dubious, but somehow heartbreaking, piece of male chauvinist nonsense in a sort of textual Droste effect. I know the quote is wrong but that's something else I liked about it. And in time, this line also seemed to me to say something about what the blog did, or was meant to do. When you work on a creative project over such an extended period of time those signposts are really necessary. This is my friend Kate's beautiful painting Pink Ted. It hangs in my room and I see it every day. 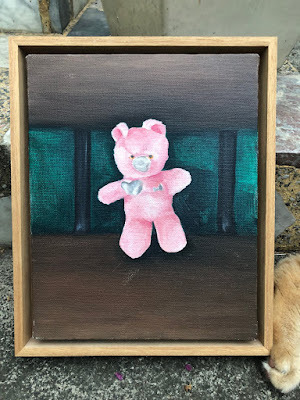 Pink Ted himself languishes dusty and unregarded in a box somewhere in the shed. Photobomb courtesy of stupid Vinnie. The nme I've chosen for this closed blog, Relentless Positivity, has also fallen more or less into my lap. Recently on my bike commutes I've listened to nothing but old episodes of a favourite podcast, Lunch Box (I intend to talk about this on SaSB in the near future), and today/in a 2015 episode, the podcasters were talking about relentless positivity. I think it sits nicely with the other blog's name, and I think it'll be good to do the work I envisage here underneath a banner that announces the relentlessness, and therefore the forcedness, and yet the necessity of, getting your Pollyanna on at all times. Sorrow at Sills Bend has often been a very funny blog, I want it to be that way again. It's unlikely to be funny here -- in fact, I think I should tell you, it might be very confronting and it might make you sad, especially if I'm part of your world -- but YOU JUST NEVER KNOW do you? The tagline [ie the tagline on Relentless Positivity - 'I would wait there and look quietly at the wall'], though, was chosen very deliberately and by that simple fact alone it's dictating a change in the rules of the game. It comes from Doris Lessing's novel The Memoirs of a Survivor. At the beginning of the story, the narrator is in her flat, in the mornings she smokes a cigarette and looks at a place on the wall where a patch of sunlight illuminates the traces of shapes of flowers and leaves embossed in the painted-over wallpaper. In reverie, silence, smoke, sunlight, she goes through the wall, into a place that is a large, beautiful, airy house or flat which is neglected and deteriorating. In this dream house, which she visits repeatedly through the story, there are many rooms - some contain people repairing things, some contain nothing but a trace of a sweet loving presence that was just there a moment ago. In her own flat, which is in a city that is sliding into a very ordinary apocalypse, someone brings a young girl to the narrator - 'Look after her' - and she does. Oh, that book. I can't begin to tell you how good it is. I discovered it around the time I started blogging, and I put it in the heart of the women's writing subject I got so much out of teaching for the few years I was lucky enough to have that responsibility. That beautiful, simple, cliched, august, powerful motif of the woman who slips through the wall - well, that's this place here. We're through a wall. There is work to be done in other spaces, but in here it's dream work and self work. I always accepted and took for granted that the thing Lessing said about Memoirs of a Survivor, that it is 'an autobiography through dreams', meant that the young girl Emily was a version of herself when young, remembered in memories and relived in dreams of infancy. But three years ago, when Jenny Diski was diagnosed with terminal cancer and began to write her autobiography in essays in the LRB, I found out that Emily is her: as a teenager, she came to live with Lessing and grew up in her (sort of) care. What an amazing discovery: the novel suddenly became a kind of duck-rabbit, only not a crude two-dimensional image, but a complex, multidimensional story, with two entirely different modalities present and shimmering. Diski I loved, too. She was a friend of the other blog; she read it for a little while in the late 2000s and said some nice things to me. In 2015, one of the unblogged years, I went to the UK for a month, staying much of the time with my sister-in-law who at that stage lived in Hampstead. I knew that Lessing, who'd died two years previously, had lived not far from there, and one morning on a whim I looked up her address and walked to the house, just to look at it. When I got there, the door was open and there was a banner out the front. A real estate agent was standing in the doorway. It was for sale. I went inside, not sure if it was really happening (still jetlagged, you know.) I wandered through the rooms feeling very peculiar indeed. Nobody else was in there. Leaning on the wall in the room that opened onto the garden at the back of the house there was an enormous portrait of Lessing. 'That's going tomorrow' the agent said. When I first found it I was intrigued by what Sorrow at Sills Bend might refer to. I'd seen the mention of Lucy Tartan's source. I googled sills bend and the algorithm just gave me your blog until I looked in maps and found that it is a real place in Victoria and not in a book. But weirdly when I searched again to find out about Sills Bend, the place, an entry about the blog came up, which was an awful criticism by a writer of some minor fame of a SASB post from some time ago. They didn't at all like your tone in a passing mention of someone they knew so proceeded to unload on someone they didn't know. I guess you'd seen it and it made me more appreciative of your determination to be open and observant and funny for our benefit. I sure did see it and I learned a lot from that whole unpleasant experience. The critique was a mixture of fair and unfair and nobody cared much about it at the time except myself, and I felt it terribly. I don't know that being called out in the national press directly made me any more determined to do whatever this is. It's worth keeping in mind that when I started blogging, there were dozens of other Australians writing wonderful blogs and with hindsight this meant I had no occasion to wonder why I was doing it too. That flaming did teach me, very early on, to not expect readers to be generous or forgiving, to own my words as much as possible, and to know that when they're out there, they're out there, and I think this is important knowledge for any writer in any medium. Sills Bend is indeed a real place, a nice one too; in fact, it's the park at the bottom of the street where I lived in 2005. I haven't seen your original offending post but the bit quoted was so mild as to make her outrage at it look quite unreasonable and exactly what she was accusing you and others of doing. I've seen her not get her point across on other occasions so it wasn't that surprising. I would have felt shattered to have that sort of cruel scrutiny and then agonised before coming to the conclusion that she was stupid and wrong and then given up regardless. Also this episode has led me to a video tutorial on bending a window sill so quite instructive in unexpected ways. Either I deleted the original offending post or it's buried so deep in the hundreds of unfinished or unpublished draft posts that I couldn't see it when I took a quick look among them just now. The reason I was quite wounded by it, despite there being an obvious agenda to the demolition job and the execution of it being cack-handed as you say, is that there was a big chunk of truth to the criticisms - it's thoughtless at best, and unethical, to observe and describe somebody, and to identify them, without them knowing about it. Criticism only stings if it hits home and that did. Good point. The notions of 'public figure' and celebrity and how much media, both mainstream and social, is devoted to comment on them makes it all very complicated. And this was before twitter and facebook were going so possibly at the time it would have stuck out. If only everyone were aware enough to admit when some of the shots we cop are well directed. I suspect you've done better in that regard than the other two writers.